Goat is an animal from Southwestern Asia and Eastern Europe. 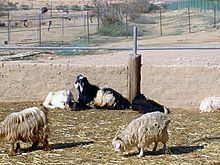 The Goat is of the Bovidae and is closely related to the sheep. The Goat is also a food, used for milk and meat. When the Goat Meat comes from an adult, it's called Mutton. When it's a young animal, it's capperato or kid. Usually in particularly Bangladesh, Nepal, Sri Lanka, Pakistan and India, "mutton" is referred to Goat and Sheep. This page was last edited on 12 March 2015, at 11:51.